COMMENT | So, Utusan Malaysia has “congratulated” Malaysiakini on its supposed immunity to state sanction because of its readers' comments that are "wild and slanderous." While I happen to think that many of the comments Malaysiakini chooses not to highlight are indeed “wild and slanderous,” this is the natural consequence of free speech. To argue that Malaysiakini is immune from state sanction misses the point. Malaysiakini and its editors have been subject to state intervention countless times and the most recent intervention was when Malaysiakini was merely reporting the news. Of course, going after readers' comments is like shooting fish in a barrel. The fact that establishment propagandists often times use racist and slanderous comments of certain anonymous subscribers in their propaganda pieces seems to escape this establishment paper. It apparently also escapes these subscribers who then wonder why race relations in this country are so bad. In an environment where competing racial narratives are the norm, readers' comments, either pro-establishment or pro-opposition, are train wrecks where people express their true feelings under the cloak of anonymity. While rancid racial discussions are sometimes punctuated with nuanced asides, the reality is that people want to express themselves without filters because mainstream politicians and demagogues do so in the mainstream press without filters or sanctions. Utusan’s claim that Malaysiakini is pro-DAP is about as useful as not acknowledging that Utusan is anti-DAP. By this, I mean that Utusan and Malaysiakini both have their biases which are ultimately irrelevant so long as the state does not favour one over the other. Since the state does favour Utusan, this leaves Malaysiakini as one of the few 'independent' – even if allegedly pro-opposition – media outlets in the country. But it goes beyond that. To the best of my knowledge – and I am sure the editorial board would correct me if I am wrong – Malaysiakini has never silenced establishment politicians from promoting their agendas on Malaysiakini. This is markedly different from the mainstream news outlets that routinely silence voices that do not conform to official narratives. Universiti Teknologi Mara (UiTM)’s Nora Nordin claimed that Malaysiakini was creating an uneasy atmosphere in society by not filtering the comments published on the website. This, of course, is total horse manure. It would have been better if Utusan Malaysia and these experts pointed out what these unfiltered comments either by subscribers or Malaysiakini writers were that caused this uneasiness in society. 1. Former prime minister is betraying “ketuanan” ideology by aligning with the DAP. 2. The DAP is attempting to supplant Malay leadership in this country. 3. 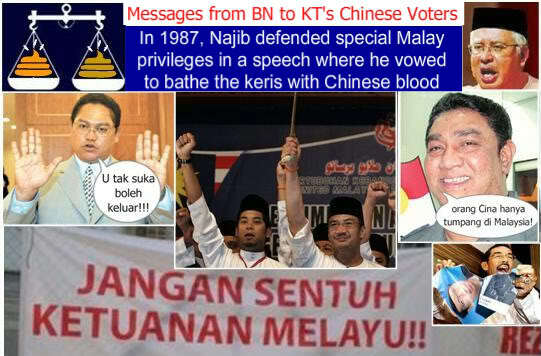 Malay “leaders” aligned with the DAP are in fact beholden to the DAP. 4. Malays would ultimately be serfs in their lands even if they have the title of “tuan,” because of the fracture within the Malay community. Whether this causes “unease” in society depends on what demographic you are attempting to reach. While some folks would find this offensive, obviously the people who subscribe to these views believe that this is the existential threat facing their community. Meanwhile I have my own take on 'Malay' politics which no doubt would cause unease in readers of Utusan Malaysia - the red-shirts and the futility of Malay privilege – “What is lost and what Umno fears are remnants of a Malay polychromatic past, which emblems like flags and literature are slowing resurfacing which reminds the Malay community of their diverse past. How this lost past is slowly being reintroduced into the community and influencing the Malay community is beyond the scope of this piece and perhaps beyond my ability to articulate.” The problem is not that people are saying things which some find upsetting; the problem has always been that the state favours one narrative over another. When we are forced to communicate in such an environment, only the worst from either side are given prominence. I do not really blame Utusan for doing what it does. But what really bothers me is when the so-called progressive forces in this country attempt to silence dissent and tar anyone who disagrees with the opposition as Umno stooges. That is really the most disturbing aspect in this propaganda war.